Rated 4.5 out of 5 stars.2861 total votes. Whether you’re stocking your linen closet from scratch or gearing up for guests, this six-piece towel set is an ideal option for your home. Made from 100% cotton, this set is antimicrobial and safe to toss in the washing machine for easy care. From washing your face to hopping in the shower, you’ll be covered since this set includes one bath towel, one hand towel, and one washcloth with a jacquard pattern, as well as another bath, hand, and wash towel in the same solid hue. Defined by dobby weaving and punctuated by the label's signature crocodile logo, the product features Supima cotton loops in a variety of colors that will suit any home. Rated 4.5 out of 5 stars.1433 total votes. Rated 4.5 out of 5 stars.1212 total votes. Perfect for your next relaxing at-home spa day in the master bath, these towels are woven of cotton. Hang them on a towel bar in the powder room, or stack them in the guest suite to welcome out-of-towners. Rated 4 out of 5 stars.1028 total votes. Whether you’re stocking your linen closet from scratch or gearing up for guests, this set of six towels offers all the essentials, including two bath towels, two hand towels, and two washcloths. Made from 100% cotton, each hypoallergenic piece is lightweight for a quick-dry design. Plus, they’re easy to clean in the washing machine and dryer (on a low, tumble setting). Though their solid hue may seem understated a classic dobby weave border completes the look with a touch of texture. Rated 4.5 out of 5 stars.825 total votes. 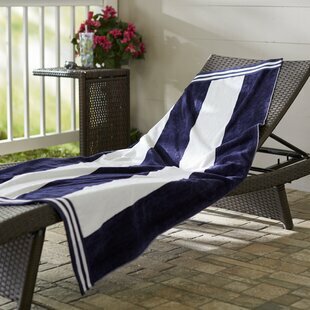 Enjoy total comfort at the beach or sitting poolside with the Cabana Stripe Oversized Cotton Beach Towel. 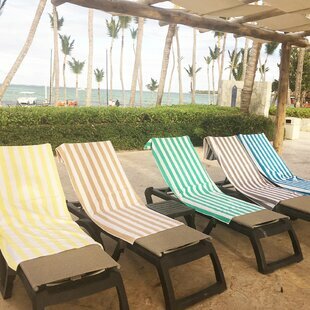 This cozy 34" x 64" size towel boasts a 100% premium Cotton construction with a festive cabana stripe pattern that is available in a variety of stylish colors. This design reverses from a soft velour side to an absorbent terry loop side that will keep you warm and dry you off quickly. This beautiful towel is colorfast and machine washable. Rated 4.5 out of 5 stars.1559 total votes. Welcome out-of-towners in the guest suite or bring a touch of spa-worthy appeal to the powder room with these lovely towels, crafted of Superior Combed Cotton and featuring stitched stripe details. Everything feels better when you wrap yourself in this beach towel. It is perfect for a lazy day at the pool, a trip to the beach, or to brighten up a bathroom. Rated 4.5 out of 5 stars.2998 total votes. Rated 4.5 out of 5 stars.489 total votes. Whether you're refreshing your powder room ensemble or just starting to stock your linen closet, small updates can go a long way. Add a splash of botanical style to your space with this washcloth, showcasing a subtle floral motif in two tones. Made from 100% cotton, this piece strikes a silhouette that’s the perfect size for washing up. For a quick cleanup, simply toss it in the washing machine on a warm cycle, then tumble to dry. Rated 4.5 out of 5 stars.1592 total votes. For a resort-worthy arrangement in your guest bathroom, stack this 6 piece Egyptian-Quality Cotton towel set atop a mirrored cart or roll each piece and nestle it in a woven basket. The plush style looks cozy and absorbent. Rated 4.5 out of 5 stars.2690 total votes. Wrap yourself in luxury with this 24 Piece Cotton Towel Set. These extra durable and super absorbent towels feature a simple yet sophisticated hobby border design that works well with any decor. 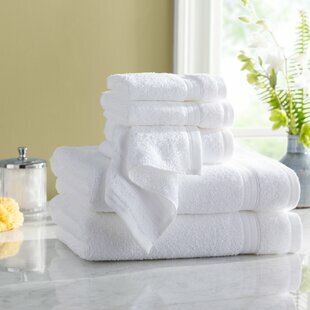 Soft and plush absorbent cotton towels for everyone, this set of 24 pieces offers an affordable price and high quality. Rated 4.5 out of 5 stars.3147 total votes. Elevate the beauty of your bathroom with this plush, Solid Towel Set. Made from 100% Egyptian-Quality Cotton, this 6-piece set includes 2 bath towels, 2 hand towels, and 2 face towels and has a cozy 900 GSM (grams per square meter) construction that makes them durable, soft, and offers long-lasting style. Available in an array of solid colors with a decorative border trim, this gorgeous set adds an elegant accent to your modern, eclectic, transitional, or traditional bath or shower space. Rated 4.5 out of 5 stars.501 total votes. Cotton is known for its ease of clean, making it a great contender when you're selecting linens. More than a functional pick, these 100% cotton towels bring a splash of style into your home as they dry you off. They showcase a mix of solid and geometric patterns, and they're available in a variety of tones so you can match them to your existing decor. This six-piece set includes two bath towels, two hand towels, and two wash towels that are all safe to go in the washing machine. Rated 4.5 out of 5 stars.22 total votes. Whether you’re starting your linen collection from scratch or gearing up for guests, this three-piece towel set is a welcome addition to your home. Though its solid hue may seem simplistic at first, this set showcases a diamond weave design for a decorative touch. Made from 100% cotton, this set includes one bath towel, one washcloth, and one hand towel, so you’ll have all you need to freshen up. Best of all, it’s machine washable for effortless upkeep. Rated 4.5 out of 5 stars.37 total votes. Redecorate your space with their fluffy, luxurious and eye-catching] Unique Unique Smooth 6 Piece Turkish Cotton Bath Towel Set for a stylish appeal. The clean lines and a silky, smooth feel provides you an excellent comfort plus coziness for everyday use. You can feel the sense of softness and smooth on your pampered skin. Rated 4.5 out of 5 stars.381 total votes. Rated 4.5 out of 5 stars.723 total votes. Whether you’re outfitting your master suite or looking to refresh your guest bath, this traditional towel set is the perfect update. 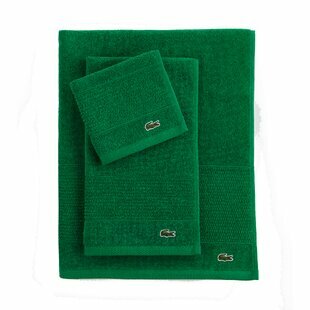 Made from absorbent 100% cotton in a terry cloth weave, these towels feature an absorbency of 450 grams per square meter, the ideal medium weight. A dobby woven border with subtle chevron striping offers a touch of appeal, while their solid hue matches any aesthetic. Machine wash and tumble dry! Arrives in a set of four. Rated 4.5 out of 5 stars.595 total votes. Whether you’re outfitting your master suite or looking to refresh your guest bath, this traditional towel set is the perfect update. Made from absorbent cotton in a terry cloth weave, these towels strike a slightly larger silhouette to keep you extra comfortable while you're lounging around after your shower. A dobby woven border with subtle chevron striping offers a touch of appeal, while the towels’ solid hue matches any aesthetic. Machine wash and tumble dry! Rated 4.5 out of 5 stars.285 total votes. Pamper yourself with the luxurious weight of 600gsm towels and washcloths when you use these cotton towels. These two-ply towels are highly absorbent to quickly dry your hands or body, with a thick, spa-like texture. Rated 4.5 out of 5 stars.785 total votes. Add a pop of color to your bathroom with this Solid Hand Towel Set. Made from 100% Ringspun Cotton, this 6-piece set includes 6 hand towels that are durable, plush, and offer perfect, everyday style. Available in a variety of festive, solid colors with a decorative border trim, this gorgeous set adds a wonderful accent to your modern, eclectic, transitional, or traditional bath or shower space. Wrap yourself in this Sheridan Turkish Luxury Bath Sheet crafted of 100% Turkish cotton. Luxuriously soft and durable, the extra-long Turkish cotton fibers are uniquely spun to create the perfect balance between absorbency and softness. Complete with beautifully finished borders for a charming look you can add to your delightful bathroom decor. Rated 4 out of 5 stars.888 total votes. Rated 5 out of 5 stars.78 total votes. 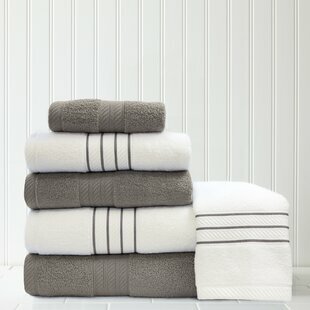 This 6 Piece Towel Set brings elegance and sophistication to any bathroom. These premium towels are soft, plush, durable, absorbent and fast-drying—everything you need in a bath towel. Rated 4.5 out of 5 stars.1680 total votes. Beach towels aren’t just the perfect accessory for a day at the beach, lake, or water park, they’re a necessity. This set of two beach towels, are made from 100% 2-ply cotton, with an absorbency rate of 550 grams per square meter. These towels have a distinctive striped pattern to them, that will help them stand out in a sea of basic beach towels. Each one measures 64'' L x 34'' W.
Rated 4.5 out of 5 stars.71 total votes. Rated 4.5 out of 5 stars.242 total votes. Make every day a spa day with the Suites Bath Towel. Crafted from 100% cotton, the towels’ densely woven three-ply loop yarn construction makes them both uniquely plush and absorbent. Rated 4.5 out of 5 stars.118 total votes. This towel set is from the Martex Egyptian collection, the all-around superior set you've been looking for. Made of 100% Egyptian-Quality Cotton, they feel super-soft against skin, and boast top notch durability. Plus intelliweave technology cuts drying time by 25%, helping you save energy. Choose from a wide range of colors that work with any bathroom decor. Rated 4.5 out of 5 stars.127 total votes. Whether helping you dry off after a refreshing shower or lending additional layers of color and texture to your washroom ensemble, this six-piece towel set is a must-have for your abode. Made in India from 100% cotton, each piece features a 500 GSM (grams per square meter) absorbency rating – the ideal medium weight for bath and guest towels. Plus, each is machine washable for easy upkeep. Includes two bath towels, two hand towels, and two jacquard towels. Rated 4.5 out of 5 stars.296 total votes. Whether you're tired of your old towels, or they're simply not holding water anymore, updating your bath linens with a set like this is a great option for an understated touch in any ensemble. 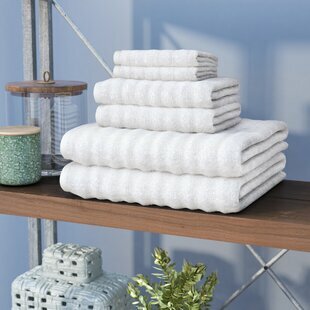 Woven from 100% cotton with a terry cloth weave, these towels feature a solid-hued pattern with a slight dot detailing. And since they're hypoallergenic and antimicrobial, they make for handy, healthy options for rounding out your linen closet. Meet this Turkish Hand Towel with its crisp white background and colorful stripes. This is a perfect everyday towel for the guest bath or the kitchen. It is hand loomed from the finest Turkish cotton and every bit as light and absorbent as all their others. Mix and match with their coordinating peshtemals. Rated 4.5 out of 5 stars.30 total votes. Transform your bathroom into a five-star luxury suite with this exquisite six-piece bath towel set. Crafted from 100% cotton, these absorbent towels caress the skin for a luxurious feel. Each set comes with two complete towel settings, so you can create a beautiful display in your bathroom while also enjoying the spa-like experience you get from these sumptuous towels. You'll feel like you're in a faraway locale lounging poolside with this lovely 100% Turkish Cotton Rische Turkish Cotton Pestemal. Featuring a subtle striped design and tasseled ends, this design makes a breezy addition to your summertime collection. Rated 4.5 out of 5 stars.1097 total votes. Rated 4.5 out of 5 stars.716 total votes. 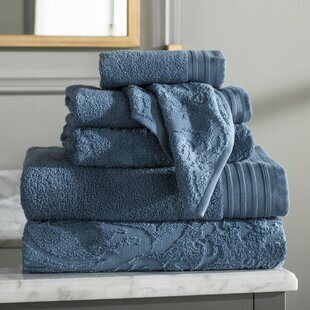 This Patric 4 Piece Bath Towel set is ideal to be taken as your favorite towels as their softness and original texture will never wear off even after repeated washes. Rated 4.5 out of 5 stars.129 total votes. Hit the beach or pool in style with this oversized Stanton Prior Diamond Drop 100% Cotton Beach Towel. Velour printed cotton fabric you may never want to leave it to go in the water but when you do this ultra absorbent, and moisture wicking towel will have you dry in no time. The laser-guided edge to edge printing method uses the latest technology to ensure complete coverage. Fade resistant for years of use. When your day is over clean up is a breeze thanks to its machine washable care. Rated 4.5 out of 5 stars.1937 total votes. Powder room in need of a pick-me-up? Refresh your spa-worthy space in style with this six-piece towel set! Including two bath towels, two hand towels, and two washcloths, this set is crafted from 100% Egyptian-quality cotton for a hypoallergenic and machine-washable design. A neutral solid hue (your choice from 10) is sure to fit right into your existing bathroom aesthetic, while stitched stripe detailing lends little a dash of distinction. Rated 4.5 out of 5 stars.131 total votes. Whether you’re stocking the guest bathroom or replacing your own spa-worthy space’s essentials, you can’t go wrong with this set of four towels. These oversized designs are crafted from long-staple cotton fibers that wick water away from the skin, while a decorative dobby border adds a touch of textural flair to this otherwise understated essential. Measuring 54'' L x 30'' W, they help turn any powder room into a hotel-worthy experience. Rated 4.5 out of 5 stars.9 total votes. The Jill Rosenwald Hampton Links towel collection combines modern style with classic comfort. The luxuriously soft navy towel in 100% cotton features Jill’s signature Hampton Links trim in white for a bold contrast. Rated 4.5 out of 5 stars.695 total votes. Rated 5 out of 5 stars.49 total votes. Bring a sense of style to the bath. it gets loftier and more divine with each wash. 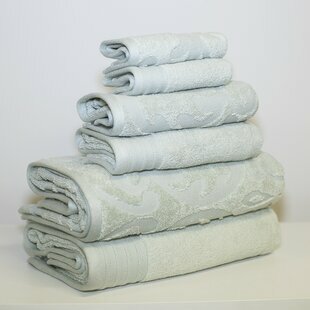 This is a damask hand towel set, categorized in fashion home living. At 580 GSM, it is just the perfect weight and absorbency. Woven decorative and soft, plush, luxurious and long lasting product. Rated 4.5 out of 5 stars.233 total votes. Each towel features wonderfully embroidered dobbies along the length of the towel which shimmer like a diamond in well-lit areas. Not only is this towel set beautiful, it’s also perfect for daily use. The 100% Turkish cotton fibers open more and more after each use, making your towel even more absorbent over time. Rated 4.5 out of 5 stars.762 total votes. Featuring raised jacquard details, this lovely cotton towel set lends a touch of texture to any space. Fold them on an accent chair in the guest suite for when visitors arrive, or roll them up in a basket tub-side to complete your spa-worthy space. Loomed from the ultimate Turkish combed cotton, the sumptuous spa-style Honeycomb 6 Piece Turkish Cotton Towel Set has extremely soft texture. Its double stitching and two-fold pile offer you a highly durable performance and a thirsty absorbency. The sculptured weaving of it provides it a sweet appearance which comes with a distinctive and lively color selection. This beautifully designed towel will energize the mood of your bathroom. At Wayfair, we try to make sure you always have many options for your home. That's why we have so many bath towels for sale on our site, including bath towels from brands like Andover Mills and Madison Park Signature. We want to make sure when you're looking for where to buy bath towels online, you're getting the one that's exactly right for you, whether that's the 6 Piece Egyptian-Quality Cotton Towel Set, the 8 Piece 100% Cotton Bath Towel Set, or something entirely different and unique to your home. We have thousands of great deals every day with no need for a coupon. There's never been a better time to "Wayfair my bath towels".